Not easy to summarize the history of Nantes in a few lines ... however, it is always interesting to be aware of the major events that have marked the history of the city that we are visiting. To us then we dive deeper into the periods that excite us. On the Gallic time, the Nantes site belongs to Namnètes who are defeated by Caesar in 56 BC, the Romans then founded Condevincum. In IIIéme century, the city took the name of Portus Namnetum. It is a walled city that is rapidly Christianized. At the fall of the empire, the city came under Frankish rule. Under Charlemagne, it became the capital of the March of Brittany. In 850, it was conquered by Breton. From 919 to 947, the city was conquered by the Vikings. Then the dukes of Brittany confront the counts of Nantes in endless succession disputes. In the XIVth century, Nantes became a ducal capital under the Montfort dynasty. Nantes is taken to the Dukes of Brittany in 1488 by the kings of France. Duchess Anne became Queen in 1498, she donated the duchy to Francis while Brittany was united to France. Nantes supports the League during the religious wars and is one of the last cities to recognize the authority of Henry IV. 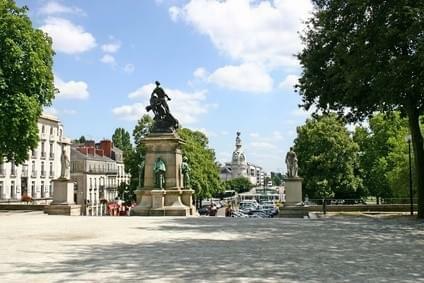 From the XVII century, Nantes thrives on sugar triangular trade, tobacco and slaves to the colonies. During the Revolution, Nantes is Republican, is spearheading the fight against the Vendée revolt. In the XIX century, Nantes is heavily industrialized, specializing in the food industry (biscuits, canning ...) in textiles, refined sugar and fertilizers. Marked by numerous floods, the city is modernized and rebuilt in the early XXth century. Having suffered the ravages of World War II, the reconstruction is long and difficult to Nantes. The shipyards are experiencing significant strikes. From the 80s, the city is modernizing and growing strongly.